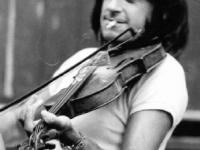 One of the giants of Birmingham’s musical history, Dave Swarbrick is an English folk musician and singer-songwriter. He has been described by Ashley Hutchings as ‘the most influential [British] fiddle player bar none’ and his style has been copied or developed by almost every British, and many world folk violin players who have followed him. He was one of the most highly regarded musicians produced by the second British folk revival, contributing to some of the most important groups and projects of the 1960s, and he became a much sought-after session musician, which has led him throughout his career to work with many of the major figures in folk and folk rock music. His work for the group Fairport Convention from 1969 has been credited with leading them to produce their seminal album Liege and Lief (1969) which initiated the electric folk movement. This, and his subsequent career, helped create greater interest in British traditional music and was highly influential within mainstream rock. After 1970 he emerged as Fairport Convention’s leading figure and guided the band through a series of important albums until its disbandment in 1979. Since then he has played in a series of smaller, acoustic units and engaged in solo projects which have maintained a massive output of recordings, a significant profile and have made a major contribution to the interpretation of traditional British music. Born in 1941 in New Malden, now in Greater London, his family moved to Linton, near Grassington, North Yorkshire. In the late 1940s the family moved to Birmingham. In Yorkshire, he was taught to play the violin by Mr. Boothman. In Birmingham, he took classical lessons from Dame Ida Neruda, a violinist with the Halle Orchestra. He attended Birmingham College of Art (now absorbed into the Birmingham Institute of Art and Design) in the late 1950s, with the intention of becoming a printer. After winning a talent contest with his skiffle band, he was introduced to Beryl and Roger Marriott. The Marriotts took him under their wing and Beryl discovered that he had played the violin up until the skiffle craze; she actively encouraged him to switch back to the fiddle. He joined the Beryl Marriott Ceilidh Band where he soon evinced an obvious talent alongside the band’s superb fiddler Kate Graham. He joined the Ian Campbell Folk Group in 1960 and embarked on his long and prolific recording career, playing on one single, three EPs and seven albums with the group over the next few years. He also played on recordings for the three most important figures in the British folk movement of the time A. L. Lloyd, Ewan MacColl, and McColl’s wife Peggy Seeger as well as part of several collections to which the Ian Campbell Group contributed. From 1965 he began to work with the rising star of English folk, the guitarist and singer Martin Carthy, supporting him on his eponymous first album. The association was such a success that the next recording, Second Album (1966), gave them equal billing. They produced another four highly regarded recordings between 1967 and 1968, including Byker Hill (1967), whose innovative arrangements of traditional songs made it one of the most influential folk albums of the decade. 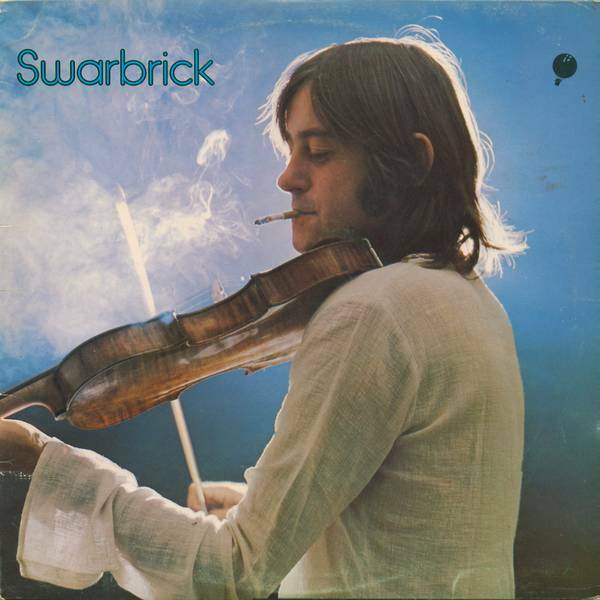 Swarbrick also played on albums by Julie Felix, A. L. Lloyd and on the radio ballads, and became perhaps the most highly regarded interpreter of traditional material on the violin and certainly one of the most sought-after session musicians. It was originally as a session musician that Swarbrick was called in by Joe Boyd, the manager of rising folk rock group Fairport Convention, in 1969, to undertake some over-dubs on the Richard Thompson-penned track “Cajun Woman”. 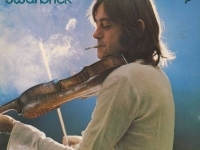 Fairport had decided to play a traditional song ‘A Sailor’s Life’, which Swarbrick had previously recorded with Carthy in 1969, and he was asked to contribute violin to the session. The result was an eleven-minute mini-epic that appeared on the 1969 album Unhalfbricking and which marked out a new direction for the band. Subsequently, Swarbrick was asked to join the group and he was the first fiddler on the folk scene to electrify the violin. Together, now with Swarbrick co-writing with Richard Thompson “Crazy Man Michael “, they created the groundbreaking album Liege & Lief (1969). 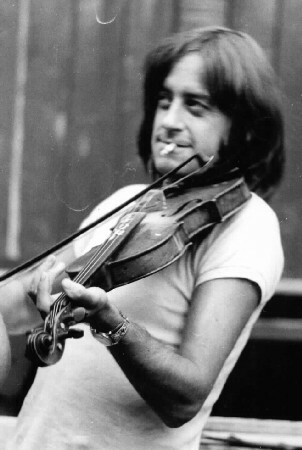 His energetic and unique fiddle style was essential to the new sound and direction of the band, most marked on the medley of four jigs and reels that Swarbrick arranged for the album and which were to become an essential part of almost every subsequent Fairport performance. Before the album was released, key members of the band, founder Ashley Hutchings and singer, guitarist and songwriter Sandy Denny left, and Swarbrick stayed on with the band full-time, excited by the possibilities of performing traditional music in a rock context. His greater maturity, knowledge of folk song, reputation and personality meant that he soon emerged as the leading force in the band and continued to be so for the next decade, encouraging the band to bring in Dave Pegg, another graduate of the Ian Campbell Folk Group, on bass. However, he was already beginning to suffer the hearing problems that would dog the rest of his career. The first album of this new line-up, Full House (1970), although not as commercially successful as Liege & Lief, sold relatively well, and remains highly regarded. Like Liege & Lief it contained interpretations of traditional tunes, including the epic ‘Sir Patrick Spens’ and another instrumental arranged by Swarbrick, ‘Dirty Linen’, but also contained songs jointly penned by Swarbrick and guitarist Richard Thompson, including what would become their opening live song ‘Walk Awhile’, and the anti-war anthem ‘Sloth’. The partnership produced another three songs on Full House. However, the fruitful collaboration was ended when Thompson departed the band soon after. As ex-Fairport Convention members embarked on their own careers, Swarbrick was often called upon to provide musical support, as he did for albums by Sandy Denny and Richard Thompson. He also played on some of the most significant folk albums of the era, including work by John Renbourn, Al Stewart and Peter Bellamy. In the second half of the 1970s he would begin to release a series of solo albums. Without Thompson, Swarbrick now shouldered even more responsibility for leadership, writing and singing and the result was a remarkably ambitious folk-rock opera album “Babbacombe” Lee, mostly all written by Swarbrick (telling the true story of John “Babbacombe” Lee, a man convicted of murder and sentenced to hang. The scaffold apparatus failed three times and Lee survived to spend much of his life in penal servitude). The result gained the band some mainstream attention, including a BBC TV programme devoted to the work, but was a mixed artistic achievement, with critics noting the lack of variety in the album. When Simon Nicol quit the band in 1971, Swarbrick was the longest standing member and responsible for keeping the group afloat through a bewildering series of line-up changes and problematic projects. The next album ‘Rosie’ is chiefly notable for the title track, written by Swarbrick, which is perhaps the song most closely associated with him, but overall it was not a critical success. The following release Nine (1974), relied heavily on the writing partnership between Swarbrick and new member Trevor Lucas, but it perhaps lacked the vitality of previous collaborations. The fortunes of the band rallied when Sandy Denny rejoined in 1974 and on the resulting album Rising for the Moon Swarbrick took more of a back seat in writing and singing. After Denny’s final departure from the band, Swarbrick managed to steer it through three more studio albums, turning a solo project into a Fairport album Gottle O’Geer (1976) and two albums for Vertigo; The Bonny Bunch of Roses (1977) and Tipplers Tales (1978), which sold poorly, but have since been seen as containing some of Swarbrick’s best fiddle work. However, all this was done amid financial and contractual difficulties and Swarbrick’s hearing problems were becoming severe and were aggravated by amplified performances. In 1979 the band played a farewell concert in Cropredy Oxfordshire and disbanded. Apart from occasional reunions, particularly at the Cropredy Festival, Swarbrick’s performing career since 1980 has focused on small venues and acoustic performances. His first project was a highly regarded duo with former Fairport guitarist Simon Nicol, which produced three albums. In 1984 Swarbrick decided to move to Scotland, while Nicol remained in Oxfordshire and the partnership dissolved. This also meant that he was unavailable when Fairport regrouped to record the album Gladys’ Leap (1985) and made public his dislike of the project, refusing to play the material at the next Cropredy Festival. When the band reformed in 1986 it did so without him, although he has played with them on several occasions, particularly at the Cropredy Festival. 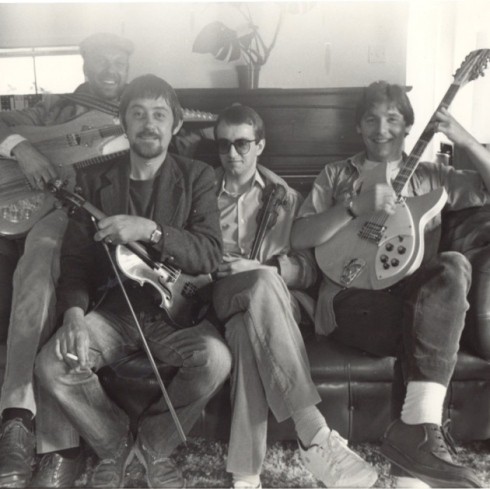 By the time of the Fairport reformation Swarbrick was already occupied with his next project as part of a quartet under the name Whippersnapper, with the highly regarded musicians Martin Jenkins, Chris Leslie and Kevin Dempsey. The group produced four albums between 1985 and 1989. From this point Swarbrick left to renew his partnership with Martin Carthy, but after two albums: Life And Limb (1990) and Skin And Bone (1992), he decided to emigrate to Australia in 1994. There he formed a new partnership with guitarist and singer-songwriter Alistair Hulett. They produced one album in Australia, Saturday Johnny and Jimmy The Rat (1996) and following Swarbrick’s return soon after, made two more. In this period Swarbrick guested on projects with some of the most highly regarded figures in folk rock, including Steve Ashley, John Kirkpatrick, and Bert Jansch as well as continuing to record and tour with Martin Carthy. 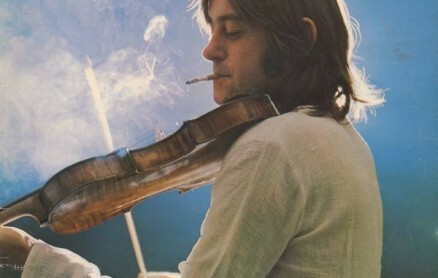 Prior to returning to England, Swarbrick recorded on what would be the first of over 500 recordings of the now legendary Australian composer Pete Hawkes, playing fiddle on just a few tracks on what would be his debut album ‘secrets vows and lies’ released by Festival Records. It was released as a duo by the label, who had control of production but Hawkes obtained the rights back from Festival some years later, and re-released the album, (and in consideration of Swarbrick’s contribution), noted him only as a special guest, (along with other guests on the re-release such as Phil Emmanuel, elder brother of Tommy Emmanuel). 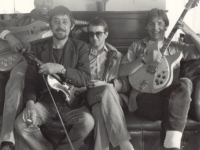 In an interview with the ABC, Hawkes had said that Swarbrick had actually recorded several tracks to tape, but he could only use three of them and the engineer Ian Blake and he decided not to release the others. After a performance with local folk rock band Eureka! in Sydney, Dave joined the band in the studio just prior to moving back to England, producing a 6 track CD – “Jammin’ with Gypsy” – where he played on all tracks. Dave and Christine Pegg launched the SwarbAid, including a fund-raising concert at Birmingham’s Symphony Hall in July 1999, and a limited-edition EP recorded live, in order to raise funds for Swarbrick whilst his poor health was preventing him from working. After a relapse they launched SwarbAid II with a similar concert in 2004. Swarbrick received a double lung transplant in October 2004 and has since resumed his career with fervour, as a solo performer and annually on tour in the UK every autumn with Martin Carthy. Swarbrick is also linked with Canadian reggae performer Jason Wilson and his band (the album: “Lion Rampant” released 2014). Swarbrick’s highly acclaimed solo album “Raison d’être” was released in July 2010. In 2006 Swarbrick started touring again with ex-Fairporter Maartin Allcock and Kevin Dempsey as the aptly named Swarb’s Lazarus, producing the album Live and Kicking (2006); and appearing at the Cropredy Festival. On 10 August 2007, Swarbrick joined the 1969 Fairport Convention line up, with Chris While standing in for the late Sandy Denny, to perform the whole of the album Liege & Lief. In 2008 Whippersnapper reformed and played a short 5 date tour. There is a possibility of a live album and a further reunion in 2009. In 2009, Swarbrick played a two-show “Ballads, Reels & One-Drops” swing with a pair of well-known Canadian artists: award-winning folk singer David Francey and reggae/jazz innovator Jason Wilson, on 8 May at Hugh’s Room in Toronto, Canada and the following evening in Wakefield, Quebec at the Blacksheep Inn. On 14 August 2010 Swarbrick joined Fairport Convention on stage for an impromptu performance of Sir Patrick Spens. During 2010 he also joined with another veteran British Folk artist Martin Carthy to play at the Cornwall Folk Festival in Wadebridge. He made a guest appearance with Fairport at the Town Hall, Birmingham March 2011 and on 31 July 2011 Swarbrick and Carthy celebrated their 70th birthdays on stage at Sidmouth Folk Week. Swarbrick and Carthy also performed together at the Cambridge Folk Festival on 28 July 2013. In April and May 2014, Dave did a 17-venue tour of the UK, supported by folk trio Said the Maiden at his personal request. The tour, organised by Helen Meisner of the Folkstock Foundation, of which Swarbrick is the patron, also featured at each venue young, up-coming folk artists, several of them from the Folkstock stable. Swarbrick is married to the painter Jill Swarbrick-Banks. They met in 1998 and married in following year. In 2003, he was awarded a ‘Gold Badge’ by the English Folk Dance and Song Society and the ‘Gold Badge of Merit’ by the British Academy of Composers and Songwriters. In 2004 he was given a Lifetime Achievement Award at the BBC Radio 2 Folk Awards. At the 2006 Folk Awards he shared with current and past Fairport Convention members when they received an award when their seminal album Liege & Lief was voted ‘Most Influential Folk Album of All Time’ by Radio 2 listeners. At the 2007 awards Martin Carthy and Dave Swarbrick won the ‘Best Duo’ Award. At the 2012 Fatea awards Dave Swarbrick was awarded The Life Time Achievement Award. Blow the Man Down: A Collection of Sea Songs and Shanties (Topic, 1993). To top it all off, he is a very down-to -earth chap, very humourous and of course a joy to work with. Hope he gets well soon, fingers crossed. Does anyone remember a local Brum Band called Clearwater. They were regulars at The Cedar club and Rebeccas when I was a teenager. A picture would be great.